There aren't enough food, service, value or atmosphere ratings for Anderson Barberitos, South Carolina yet. Be one of the first to write a review! I have always like Barberitos food, but the Anderson location was super slow. The new owners have turned that around and made this a much better service environment. 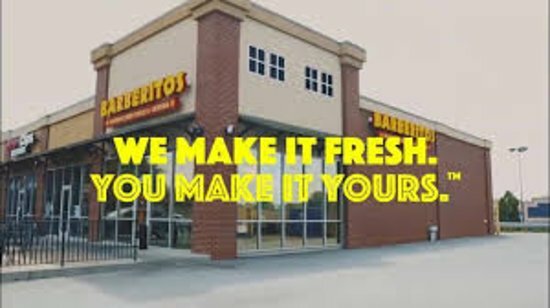 Barberitos is similar to Moe's or Chipotle but just not quite as good. The staff is nice and the dining area was clean...but not the restroom. As these types of restaurants go, Barberton is good. Our like their taco salad. Lots of fresh ingredients. The chips however do not rate very high... Too stale. I have eaten lunch here many times. Always enjoyed it. I love being able to customize my burrito. It has always been good quality and delicious. Go to moes or chipotle instead! Something about this place always makes me regret coughing up 9 bucks for a burrito and a tea. The food is mediocre, chips are gross, unless you're into greasy paper, and the staff usually looks as greasy as the chips do... Go across the street. Get quick answers from Anderson Barberitos staff and past visitors.